In this Cafe Art we will look at the Gare Saint-Lazare and the area surrounding the station with its streets named after many European capitals. We will discover how different aspects of this modern theme appealed to artists. 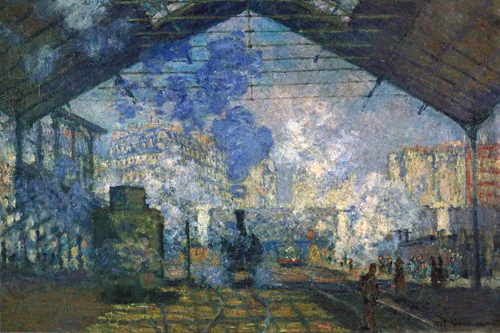 For Monet it could have been the atmospheric effects he could achieve with the steam from the locomotives inside the station itself. Caillebotte found inspiration in the iron structure of the Pont de l’Europe, while for Manet it was perhaps the modernity of the subject matter. Talk in French by Agnès Ness.